Complete scores and part of 2 Courantes for Flute and Harpsichord (or Piano), by George Frideric Handel. Transcribed by Santino Cara. Complete score of 2 Courantes for Harpsichord or Piano by George Frideric Handel. Reconstructed and elaborated by Santino Cara. 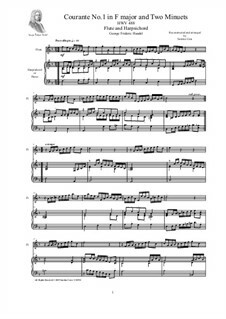 For flute and harpsichord (or piano) Arranged by Cara S.
For harpsichord (or piano) Arranged by Cara S.